Matchmaker Jessie Hancock has a perfect record helping others find their Mr. or Ms. 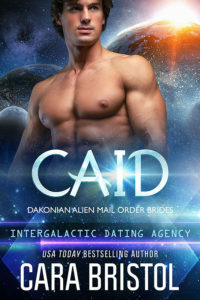 Right through the Intergalactic Dating Agency until Caid arrives. 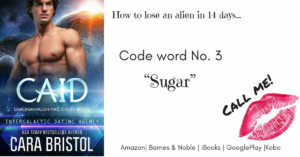 The sinfully handsome, smooth-talking alien is everything she’s dreamed of—but can’t have. Even if he was interested in a curvy, freckle-faced redheaded wallflower, it’s forbidden for employees to date clients, so she works hard to find him a woman. But when none of the dates meets with his approval, her boss gives her an ultimatum—find Caid a match or else! With her heart breaking and her job on the line, she launches a plan to introduce Caid to a woman he’ll find irresistible. The instant Caid from planet Dakon lays eyes on Jessie with the beautiful orange hair, he knows the Fates have chosen her for him. To get closer to her, he goes along with her attempts to “match” him with someone else while doing his best to charm her and convince her they’re meant for each other. Despite his efforts, she continues to insist she can’t be his mate. Now time is running out, and if he can’t up his game, he’ll lose her forever. Available here from Amazon, BN, iBooks, Kobo and GooglePlay.